SHAKING THINGS UP is not brand new. It actually came out in January. 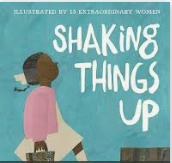 Franki Sibberson, (who is currently presiding over what sounds like a fabulous NCTE conference, if all of the tweets coming out of Houston are the least bit reliable), reviewed the book in January. (I thought Mary Lee also reviewed it, but I didn't find that on their blog. Each two- page spread includes an illustration by a different author (Sophie Blackall, LeUyen Pham, and Melissa Sweet are three of my favorites), and a short biography. Each spread also includes quotes from that person, embedded in the illustration. Nellie Bly- If you want to do it, you can do it, The question is, do you want to do it?" Frances Moore Lappe- Every choice we make can be a celebration of the world we want. Malala- There's a moment where you have to choose whether to be silent or to stand up. The book also includes a timeline, a gorgeous table of contents, an author's note, and then a short bibliography and list of resources about each person. A whole lot to love about this book! I enjoyed this book very much, Carol. It would be so nice for every classroom to share it! I missed this book when it came out, but it looks like a wonderful collective biography. Will check it out!